The finest vintage of Mercedes is Fangio 1954. 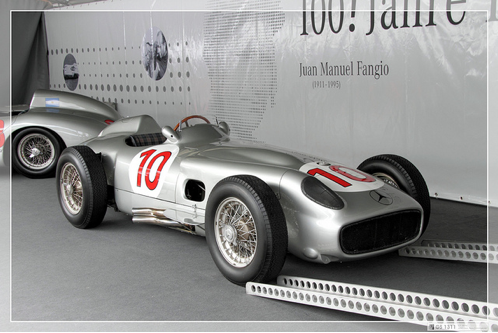 The Mercedes W196 Formula One racer that Juan Manuel Fangio drove to victory in the 1954 German and the Swiss Grand Prix races continues to set records nearly 60 years later. 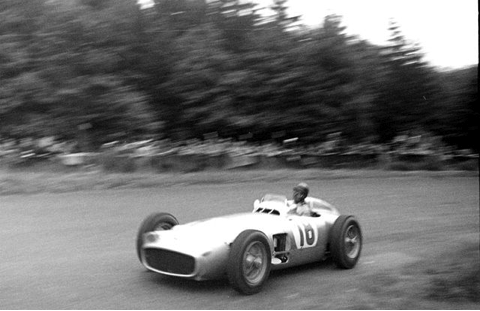 Earlier that season, Fangio won the French Grand Prix in another Mercedes. The record $31.6 million sale of this car proves that the engineering precision, attention to detail and quality craftsmanship exhibited by Mercedes are the keys to ultimate success as an automaker. In accordance with the W196 model designation, the UK cost of the car at the Goodwood Festival of Speed was 19.6 million British Pounds. In typical Mercedes fashion, Rudolf Uhlenhaut chose to use an uncommon yet sensible approach to the problem of valve springs limiting engine rpm. He featured one of the most reliable valve actions possible at the time, not generally seen because of expense. This type of valve train goes by the exotic name “desmodromic” and uses two cams, with each valve having a lever that closes it instead of using a spring. This allowed for reliable long-term operation at very high rpm. It also eliminated the valve spring, a part that is prone to breakage when subjected to the high temperatures and harsh environments seen in Formula One racing. This would be an interesting enough design choice, even on a modern V8 or V12, but Mercedes chose to package this design into an inline eight cylinder engine, at a time when the competition was building V8s, along with inline sixes and fours. This choice of power plant dictated the car’s envelope, resulting in a very long hood even by the standards of the day. By laying the engine down “sideways”, the car ended up with an aerodynamic shape, long, low and wide compared to the competition. The chassis design was an all-new space frame with aluminium body, and Mercedes was the first to introduce four-wheel independent suspension into Formula One with this car. Mercedes has always thrived on a drive for technical excellence that pervades its every activity. Not only did it field a superb design by a great engineering team, it put the greatest driver of the time behind the wheel, going that extra mile to achieve its desired goal. 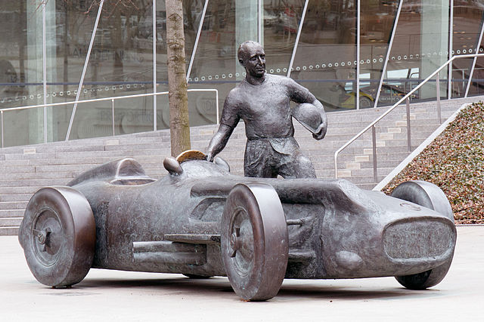 Juan Manuel Fangio was perhaps the greatest racing driver in history, with five championships in a Formula One career of only seven seasons. His technical excellence in the art and science of racing was the perfect complement to the technical excellence of the engineers and of the car itself. Fangio, for all his driving prowess, was well known for the respect he carried for the individual members of the Mercedes race crew. As a well-seasoned veteran, he understood the vital importance of accurate diagnosis, intelligent choices and superb competence. Only a factory-certified team with seasoned credentials can deliver these results. This applies as well today in traffic as it did 60 years ago on that track at Nurburgring. Juan Fangio always said that Mercedes was his favourite team. He said that when he came off the track and requested a change, the team would work around the clock and deliver just what he asked for, just when he needed it. If there was an accident, the team was on the spot, returning his sophisticated ride to perfect factory specifications, performing with precision. His admiration for the education, experience and dedication of his support team was well placed. Six decades later, the automotive legend they helped to nourish has achieved a vintage never imagined by Rudolf Uhlenhaut and Juan Manuel Fangio. Whether or not your car ever becomes an automotive gem, your Mercedes never needs to grow old, with the right support team. Instead, this commitment to excellence means that its vintage will only improve with age. Every family needs an heirloom, after all.